Encinitas, CA – February 7, 2013: Arnette’s regional Cash Pot Surf Series is back paddling around the U.S. for its third year in a row, this time with an expanded multi-day format to allow for better events and a social media contest that lets the crowd on the beach come home with prizes too. 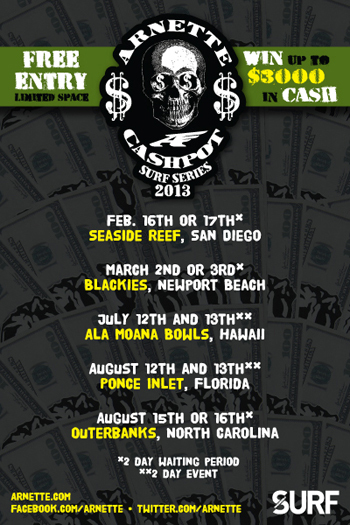 With the support of returning media partner TransWorld SURF, the Cash Pot Surf Series will feature five free-to-enter events going down in California, Hawaii, Florida and North Carolina, beginning with the first event on February 16, 2013 at San Diego’s Seaside Reef. Major changes have been setup for this year’s rendition of the Cash Pot. The Hawaii and Florida stops have been expanded into two-day events, with heat winners from the first day returning the next day to battle it out in the water. The events in San Diego, Newport Beach, and North Carolina will each feature a two-day waiting period, which will allow judges the flexibility to attempt to hold the contest in the best possible wave conditions. All Cash Pot Surf Series events are beach entry only, with limited space available. Interested participants should plan on being at their local stop by at least 6:30 am the day of event. The Cash Pot Surf Series will feature two divisions at each stop – Pro-Am and 16 & Under – with $3,000 in cash up-for-grabs at each event. Judges will hand out money to the winners of each heat, as well as specialty prizes throughout the day, at their discretion. Cash Pot #LIVEARNETTE Social Media Photo Contest As a bonus for spectators, Arnette will be giving away prize packs, including sunglasses, to people who post photos from each event on Instagram and Twitter. To enter, photos must be tagged #LIVEARNETTE, #CashPot and @Arnette. One winner will be chosen from each event, based on photo originality and caption creativity. More information about the photo contest side of the Cash Pot can be found on Arnette’s Facebook page closer to the start of the series. At each contest, ASP judging criteria and interference rules will be in full effect, with prize money going to the winners of each hear. More info and updates on the Cash Pot Surf Series, including downloadable entry forms, will be posted online before each event at www.arnette.com, www.facebook.com/arnette and www.twitter.com/arnette.